When Rayann and Joseph were young I would tell them that I needed more than a day to celebrate my birthday. I called it the week of Dad. Whatever week my birthday happened to fall upon became a seven day celebration of me. Most of the time I was the only one celebrating while they howled in protest, declaring that you only got one day to celebrate your birthday. Rayann eventually caught on and told me she needed a week of Rayann. That is when the week of Dad died. I could not afford a weeklong celebration of Rayann’s birthday. I thought about the “week of Dad” today. 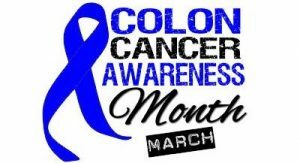 Nancy told me that March was National Colon Cancer Awareness Month. Who knew? I had a whole month to celebrate me and this struggle we are going through. March is almost over and I am just finding this out? You would think I would at least be getting free coffee at WaWa during March. I am on my second six week break from chemotherapy. What kind of fun, exciting things can you do while taking a break from chemo? The list is endless. You could travel somewhere special. I thought of taking a few days away with just Nancy. As my energy returns I am finding that ministry is very fulfilling and spending time in study and preparation is life giving. The possibilities of what one could do are endless. Last Friday when I met with my oncologist we talked about this second six week break. I just about fell off the table when I heard him say, “Now that we are taking a break from chemo…this might be a good time to get a colonoscopy.” What! I can think of many things that it might be a good thing to do while on a break from chemotherapy. Spending time preparing for and then going to get a colonoscopy would not ever make my top 100 list. The truth is that while it might not be the most enjoyable thing it could prove helpful in my treatment. I never had one since nothing a colonoscopy showed was going to change my treatment plan. Having one now will help better understand exactly what is going on and may help shape future treatments. So, on Friday I head in to have my colonoscopy. I was diagnosed with Stage IV Colon Cancer at the age of 47. A few years ago (4-5) I sat in my doctor’s office during a physical and we talked about whether or not I should have a colonoscopy. I was in my early 40’s. The doctor’s wisdom was, “You are still young, we do not recommend a colonoscopy until you are 50. We could do one, if you want to, but I do not feel it is necessary.” “If I want to?” I don’t think there are many people who want to have a colonoscopy. Tell me I ought to, or that it would be helpful and I will do it. If you are asking me if I want to undergo the procedure…my answer will always be a solid “No thank you.” Chances are if I had gone forward with the test it would not have shown anything. My Cancer is an aggressive form and was probably not present then. No matter, it is a conversation that haunts me. What if? to take care of business. It is not exciting. There is little about it that sounds pleasant. I can assure you the brief moments of being uncomfortable beats months of chemotherapy and all that comes with those treatments. I met with my gastrointestinal doctor Tuesday and my test is scheduled for Friday. There are only a few days left in March. Take the first step and schedule an appointment with your Doctor. As we get older it is nice to hear someone tell us we are young. Do not be flattered if your doctor says you are too young for a colonoscopy. It is your body, your healthcare. Take control and get the test. I pray it comes back normal. 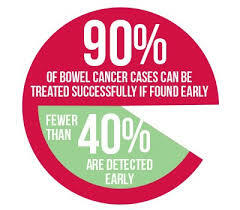 If they find something abnormal you will be glad they find it early.